Health, Wealth and Wisdom have been an inseparable trio for ages. So it sort of goes without saying that Healthy Living and Healthy Finance go hand in hand. In this article, I will share with you six tips to can make huge savings on your attire bills. These are easy to do practical tips that work extremely well. All you need to do is to make a conscious decision to follow these as you plan and do your shopping. Don’t fall for the 25-30% off or buy two get one free. Go for the 60% or up discount ones. You may have to hunt through to find you size and the designs you like. Because often items on the sale racks may be less organized than those on the regular shelves. However, just a few extra minutes of your time and effort will be well worth the savings you get. I’ve been able to purchase high quality casual and formal wears that sell for $200 – $250, for as low as $35 – $50. On some lucky days you may even get excellent high quality causal wear for as low as $5 to $10! Often, when you see high quality items on sale, there is a tendency to “overbuy”. Before you make that shopping trip, make sure to take an inventory of what’s in your closet. Have a clear idea of what you want to buy. If you tend to forget, you should write down the list of items you need to buy and take it with you to the shop. And most importantly, stick to this list of “to buy” items. if you want to do financially-wise shopping. You need to have an assortment of clothing and shoes to wear to the different occasions you routinely come across. -spare you from having to run to the store when you need to attend that birthday or cocktail party. For example, you may need a few sets of formal wears – for church, to look professional at work and so on – although you certainly don’t need dozens of these. You will also need a couple of party dresses and a few causal wears. When you do your shopping, make sure you have a well-balanced number of formals, party-wears and machine-washable casual wears. Most of us have a financially savvy model for using our kitchen sponges. The newest sponge is almost always used to wipe the dining table. Once it has been used a bit – it is reassigned as the kitchen countertop sponge. Further down the line it becomes the kitchen sink sponge, before it finally ends up in the trash can. We can use this model for some of our outfits also. Many of your casual-wear, after due course, can be re-designated as your home-wear. In fact, you may need to purchase almost no new home-wear clothing. A little bit of planning can go a long way to keep the money in your wallet. Don’t wait until winter to buy your winter coat, winter clothes and winter shoes! The best time of the year to buy your winter clothing is right toward the end of those frigid, freezing months. This would be around the end of February through March, if you are in North America. Likewise, the best time for summer clothes is towards the end of the summer season. The amount of money you save from these off-season purchases should be plenty motivation to let these sit in the closet for a few months before you wear them. Yes, using a credit card is equivalent to borrowing money. I am not saying that you should not use credit cards. If you know that you are not financially disciplined enough to limit your spending within your net income levels, it will be extremely helpful for you to limit the use of your credit card. Switching over to pre-paid debit cards can help. You could even keep a separate one just for your clothing and shoes budget. If you follow these tips, you will be amazed at how trendy you can look with so little $$$. The Suze Orman website provides a wealth of financial planning information and resources. The information that Suze Orman provides in this book are gems that can be used to transform your financial life from the inside out. The book contains several practical how-to items to help build your plan for financial freedom. A key aspect that Suze stresses is the importance of overcoming your fears surrounding money and the concept of money – as an essential pre-requisite for achieving financial freedom. 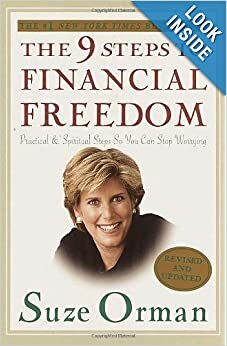 In this book Suze Orman describes five laws or principles of money that are important to understand, to be financially healthy. It explains the principles in the context of real-life examples. It also provides several how-to action items on personal money management that are useful to create a plan to start taking control of your money and your life. This is a powerful self-help book for those interested. It does not provide any step-by-step or how to practices for building a financial plan. It tells you a holistic approach for creating your abundance environment that will lead you to mental, emotional and financial freedom.